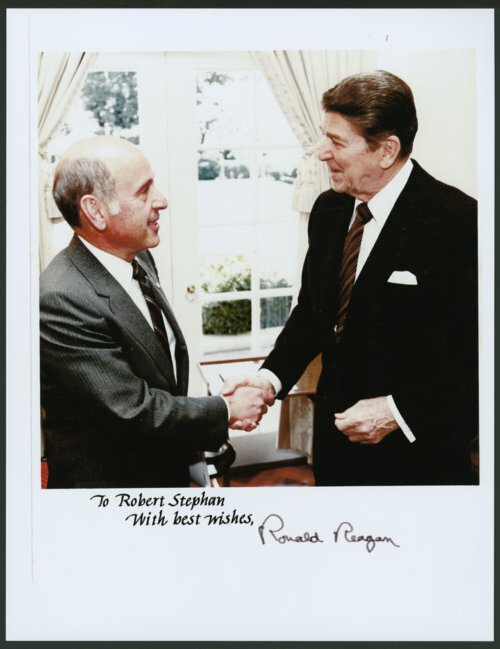 This is a photograph of Robert T. Stephan shaking hands with President Ronald Reagan. After graduating from Washburn University's law school, Robert T. Stephan practiced law in Wichita, Kansas. From 1965 to 1978, he was a district court judge in Wichita, Kansas. In 1979, he was elected Kansas Attorney General and he served in that office for 16 years. He helped craft and eventually win passage of the 1992 Victims' Rights Amendment. The legislation established a compensation fund, crime victims' board, community grants, and revised sentencing guidelines in Kansas. After leaving office, he moved to Lenexa, Kansas, and worked as a corporate legal consultant, dealing principally in consumer protection matters and federal trade commission rules in regard to marketing. Stephan has received many awards for his service to the state and community.